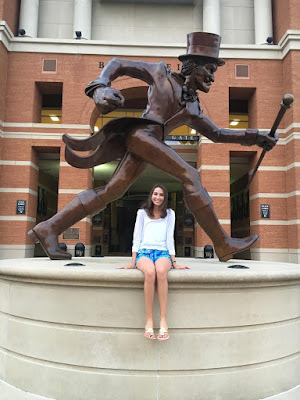 I know I've shared little pieces of my college admissions story on the blog, but it is all in separate posts and is missing some of the connecting information. 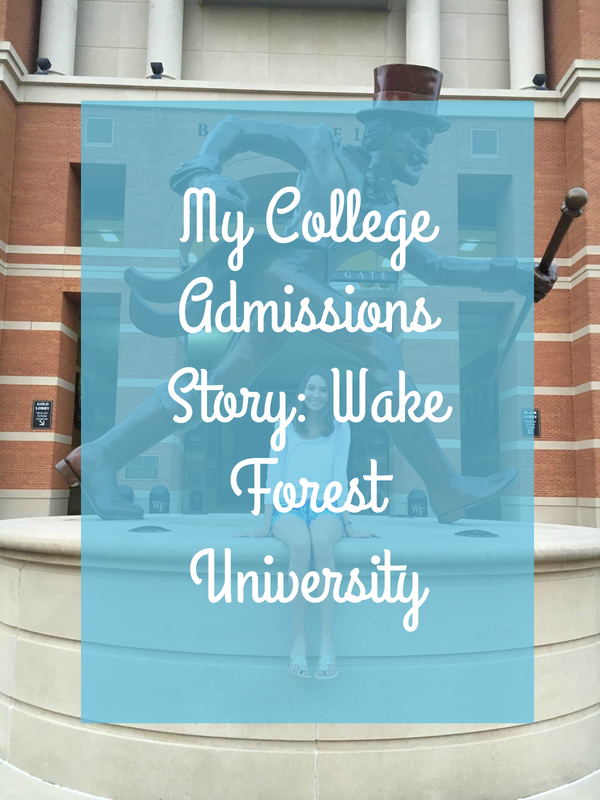 As a result, I thought it would be fun to share my whole college admissions story from when I figured out Wake Forest was my dream school to the interview to applying and finally getting in! Hopefully, this story will be fun to read and also helpful for those of you who are high school seniors or juniors. I began touring colleges in the beginning of my junior year. The first school I toured was Emory University because it was close to home. I knew that I didn't really like it and that I wanted to look outside of Georgia. I instantly began looking at the surrounding states and the schools that they had. After making several lists I decided that North Carolina was the best distance and had the most schools that I was interested in seeing. 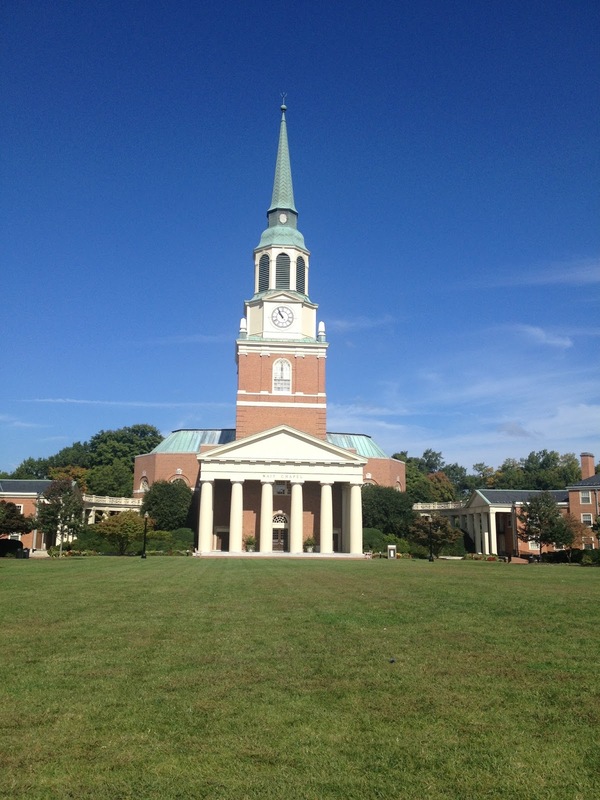 As a result, we set off to tour Duke, UNC Chapel Hill, and Wake Forest. We left Thursday afternoon and spent the night in Chapel Hill. 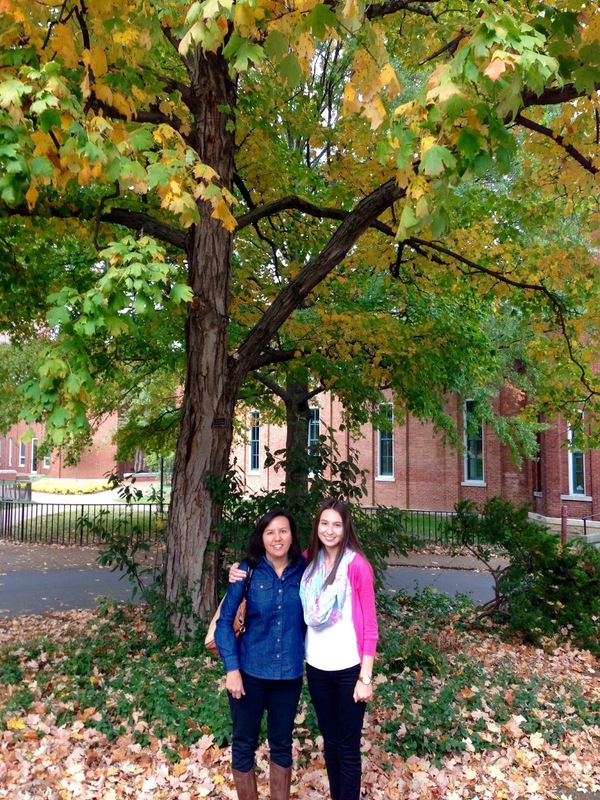 Friday morning we toured UNC and that afternoon we toured Duke. I kind of liked UNC and I really did not like Duke. I was feeling a little discouraged that night as we drove to Winston-Salem. That night we decided to drive through Wake Forest, so we could get an idea of where we had to go in the morning. I instantly fell in love. It was night and the campus was dark, but somehow it just felt right. I was relieved, but also very confused. How could I fall in love with a school so quickly? The next day we had an awesome tour of the campus and my feelings were solidified from the small class sizes, caring professors, pro-humanitate motto, ACC sports, and super nice students I knew this was the place. I went home so excited! First picture I ever took at Wake! I spent most of that year happy that I had found a college that I really loved. But I knew with selective admissions, I couldn't just rely on one school. In October I went and toured Vanderbilt, which honestly I don't think I stood any chance getting into and didn't really like at all. It was really important for me realizing that I needed to find more schools that I really liked as back-ups. We decided to plan a trip to Virginia to tour schools for spring break. I was excited about the schools, but I was nervous about the distance since the schools would be 8-9 hours from home. While in Virginia we toured Washington & Lee, University of Virginia, University of Richmond, and William & Mary. I loved the rich history of all the schools that we toured. I didn't like Washington & Lee or Univeristy of Virginia, the first was too small and the later was too big. 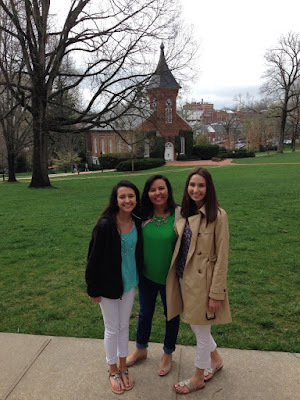 I really liked University of Richmond and William and Mary. University of Richmond definitely was my favorite, but it just didn't make me feel the way I did about Wake Forest. I felt a lot better after that trip that I had good back-ups. We also ended up going to Wake on our way home to see a tennis match, which was really fun! It was cool to see another side to the school. I finished junior year pretty content about where I wanted to apply. 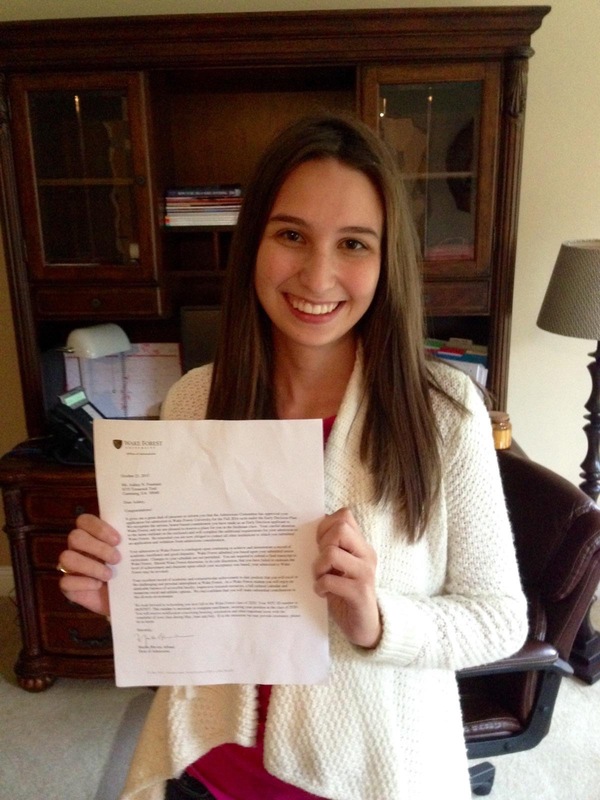 I knew I wanted to apply early decision to Wake Forest because it was without a doubt my first choice school. I registered for an interview in mid-July. My dad and I headed up for my interview and I was extremely nervous. It ended up going great. The interviewer was so nice and we had a lot to talk about. The whole interview lasted for around an hour. On the way home I wrote the interviewer a thank you note, thanking her for meeting with me and providing valuable insight. I don't know if it counted at all for admissions, but it just felt like the nice thing to do. After being at the campus for the third time, I was giddy to begin applying! 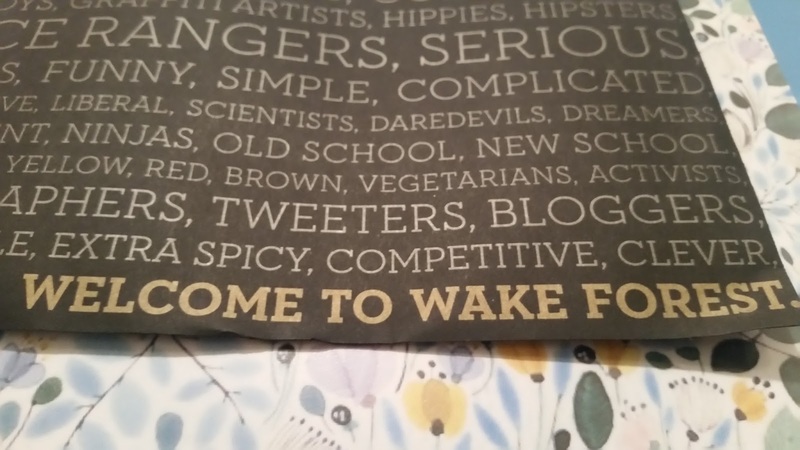 I decided to apply through Wake Forest's application, instead of the common app because it opened first. If you didn't know Wake Forest has rolling decision for early decision. So I decided I would get the application in early enough so that I could wait to apply to any other schools until I received my decision. If I got in then I wouldn't have to apply to any other schools, and if I didn't get in or got deferred I would have time to do the applications. I started the application in late July and didn't submit it until September 7th. The application has 8 essays and I wanted to make sure that they were all perfect! My counselor took a long time to submit his part, but everything was in by the end of September. 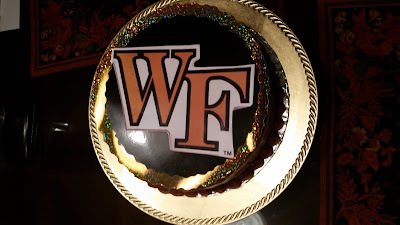 Wake Forest only sends their decisions through the mail, and there was no set date it was supposed to come, so I just checked the mailbox every day. I made sure that it was me that checked the mail because I didn't want anyone else to see it first. My mom had gone on a cruise for the week and had no internet or way of talking to us, and I had a feeling that I would get my decision while she wasn't there. And of course, I did, I received my decision October 27, the last day of my mom's cruise. Thankfully, my dad and sister were both home with me when I got the decision to celebrate with my because I was accepted! 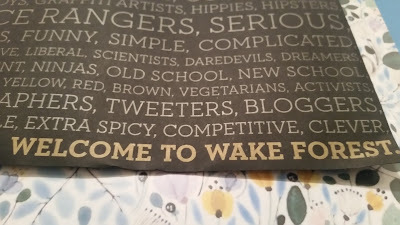 It was a gorgeous black and gold envelope with the words welcome to Wake Forest. I could not believe what I was reading at first, I re-read it at leas 20 times before the biggest smile showed up on my face and I went oh my gosh, oh my gosh repeatedly. I called my grandparents and took a cute picture for my Instagram. I was so grateful and excited. I was able to call my mom the next day and tell her the good news. 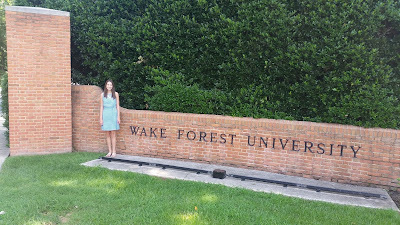 I was going to Wake Forest!! The envelope it came in! Me with my acceptance letter! I got accepted on a Monday so that Saturday we had a little bit of a party. My grandparents came over and my grandma made me a super yummy cake and we went to my favorite restaurant. 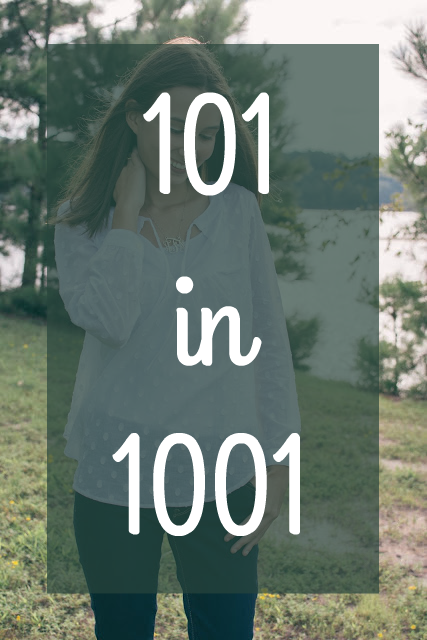 I hope this post was interesting and helpful to read! 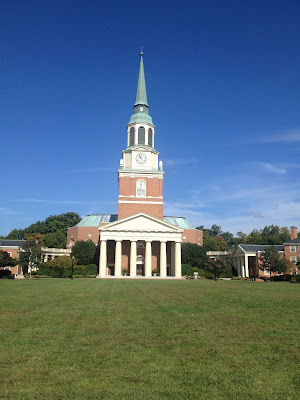 If you ever have any questions about Wake Forest than please feel free to ask me, I would love to answer. I love Wake Forest and love to talk about it! Comment down below or shoot me an email! Monday I will be sharing my application tips so look out for that. Nice story, my congratulations . Besides, if somebody need to buy admission essay I can recommend you to use write2me online writing service, this is the best solution to get quality admission essay. Wow, really great review of your university, you definitely have really good writing skills, cuz for example I could not to write such well written text and I have to use all the time the help of this service https://academicsavers.com/write-my-essay. Thanks a lot for sharing!